Thanks so much for this, I was getting pretty worried about my FreeNAS install when my old Dell Poweredge T310 with the PERC H200 gave me the “Firmware version 2 does not match driver version 16 for /dev/mps0” in FreeNAS Alert. Then when I upgraded it to the latest that dell would give me that only got me this far: “Firmware version 7 does not match driver version 16 for /dev/mps0” in FreeNAS Alert. Then I found your post and although it sounded a bit scary I decided to give it a go since I don’t really need the hardware raid capabilities on the card anymore. I followed your directions substituting the P16 version for the P20 as freenas 9.3-stable in my case wanted version 16. The alert is gone now and everything is working smoothly. Thanks so much for taking the time to put this together and post it, I really appreciate it! Much like John I came across your post while trying to setup an older R310 with a H200 with FreeNAS. I followed your directions to the letter ( substituting P16 for P20 but using the P20 loader) to match what’s in the latest 9.3 Stable release of FreeNAS with full success. It definitely seemed to be hiccupping and complaining the whole way but it ended up just fine after reboot. Thanks for putting this up in as succinct form as you have. I just tried the process and all is done exactly as you’ve laid out, however, my results are not what I expected. If you have any suggestions to offer, I’d be grateful. Doing this process on a new PowerEdge T110-ii, fwiw. At step 7, the erasure process produced an error just like you described. Step 8, however, hung at “SAS2FLASH: Disconnecting the EFI driver”. After 20 minutes, felt nothing left to do but force power off, which I did. Upon reboot, noticed the options to enter the Dell raid configs were not present and the drives listed in the rufus boot USB key were no longer there. Performed steps 5 and 6 again and they both succeeded with the H200 being listed and in detail. Attempted step 7 again (just in case) and it exited cleanly this time (no errors). 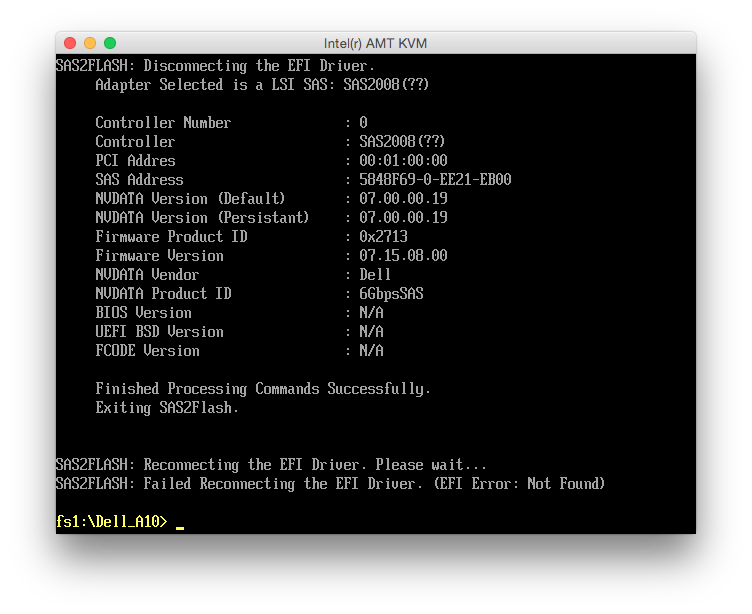 Step 8 for the Dell firmware resulted in 3 output statements: 1) “No LSI SAS adapters found! Limited Command Set Available!”, 2) “ERROR: Command not allowed without an adapter!” and 3) “ERROR: Couldn’t Create Command -f” and returned to the command prompt. Attempted step 9 this time and it hung again for >20 minutes with no output/return. I assume I’ve bricked the H200 card, but unsure. If you have any suggestions, I’m all ears. Thanks for the post and considering assisting on my description. I don’t think it’s bricked. The worst thing I’ve heard about is an erased SAS WWN identifier, but I assume you wrote that down before you started and you can re-program it later. 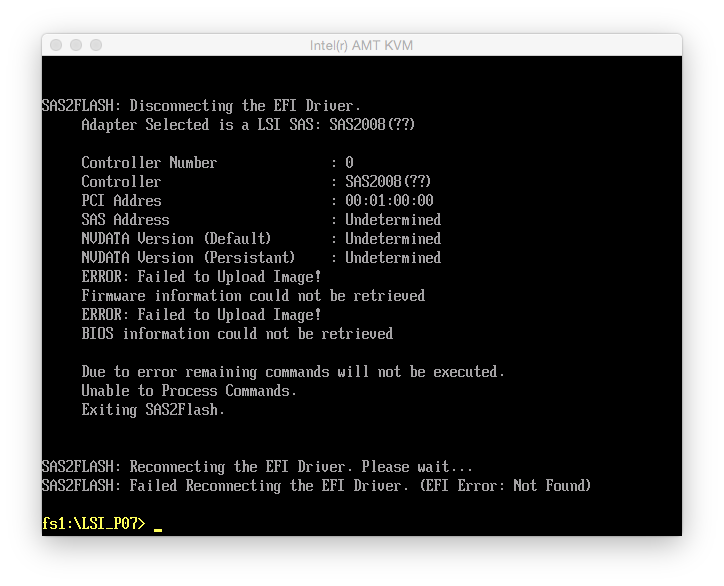 It’s most likely a mainboard issue: sas2flash might not work equally well with all UEFI implementations. Try a different sas2flash version, a different PCIe slot, a different computer, try flashing it from within Windows or Linux, try flashing it on a BIOS-based computer using a DOS disk. On a BIOS-based computer, you should also be able to use the older megarec tool to do a recovery flash. The sas2flash documentation also mentions some situations in which certain methods of flashing might or might not work. Thank you for this posting. It allowed me to flash P16 IT firmware on my Dell Perc H200. Card came with P15 Dell firmware, which appeared to list card in IT mode, in bios, but there must have been another place where IR is noted because I kept repeatedly getting “Error cannot flash IT firmware over IR firmware” message. After going through LSI P07 IT firmware first, I was able to finally flash P16 IT. Thanks for this helpful and informative post. Brilliant article. Thank you for this – I am not on IT firmware v 20.00 and all is working fine. Finally conquered all my issues with ZFS under Free BSD v 10.0. By the way – because I am using server board (SuperMicro Dual Xeon X7DT3-F) I which does not support UEFI boot, but nevertheless used DOS (FreeDOS) and the sas2flsh.exe utility there behaves exactly in the same way as the one for Linux (sas2flash.efi). Just to let you guys all know that FreeDOS boot will exactly the same thing. 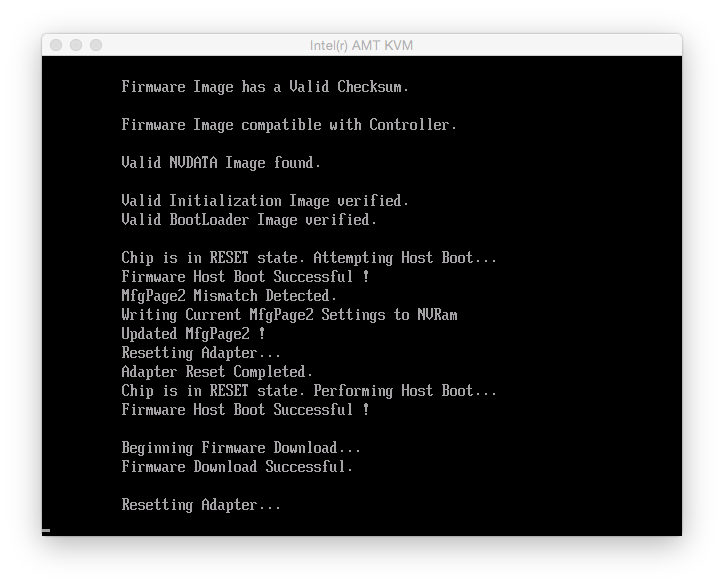 And by the way – I never re-booted even once during the whole flash procedure – erased the firmware and then 3 times flashed the adapter and never got a single error. There was only one warning – when I flash the LSI P07 over the DELL P07, but I ignored it of course :). I’m hoping someone can help. I followed this guide (great job, btw), but the card won’t boot in my R710 in the motherboard slot. I get the “Invalid card” error. I can boot if I put it in a regular PCIe slot, but then the cables aren’t long enough. I’ve tried everything I can think of to get it back to stock, so it’ll boot again, but nothing seems to work. I’ve flashed the official Dell H200 adapter, integrated, and modular firmwares (all version 7), but I still get the invalid card error. The card seems to be working, of course… it just won’t boot in the original slot. My only goal was to get a version 20 firmware so FreeNAS 9.3 is happy. Of course, I want passthrough working as well. I would probably just get the longer cables… but I want to be able to use the PCIe slots for SSDs. First, I was able to finagle some extra slack from the cables behind the backplane… more than enough to reach the controller in the PCIe slot. Though I still wanted to use the integrated slot. I’m not sure if you have to flash the SBR and SPD back. I didn’t, and I don’t have a boot ROM. It just flies right through that part of POST. Dude great write-up! 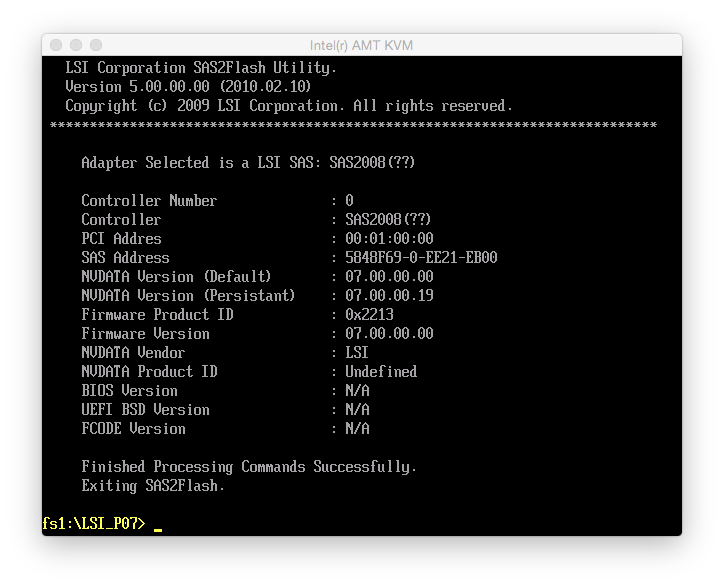 You hit all the little bits that others tend to leave out, like the correct versions of the LSI sas2flash.efi. Thank you for allowing me to keep some of my hair on my head!!! Would like to leave thanks for this great guide. I’ll confirm this works, as is, with a Perc H310. The key bit some other guides on the internet omit is that you need the older, P05 firmware version, of sas2flash.efi in order to be able to complete this. Thanks for this, the only post with the clear firmware versions that will make this work. You have helped many, well done. What am I doing wrong? The disks are almost new 6 TB WD REDs. No SMART errors on them at all! Can this be a bad cable or am I missing something here? The errors am I am getting are only on the 3rd drive in the ZFS array – /de/da2. This thing is driving my crazy from about 2 weeks – any help will be highly appreciated! For anyone else using an old server (like a PowerEdge 2900) that doesn’t support UEFI boot, I was able to use Rufus (http://rufus.akeo.ie ) to make a USB boot disk and use the sas2flsh.exe executable from each of the firmware packages (in the “sas2flash_dos_rel” folder) instead of sas2flash.efi. Everything worked perfectly fine substituting sas2flsh.exe in each of the commands. Man, I think I messed up. Everything went well, except for whatever reason it will say “No Image” under “x86-BIOS”. Because there is no image, I will not get the controller in the POST screen? I was just giving this a go to see how it worked on a Dell PowerEdge R410. Do you mean like the “BIOS Version: N/A” in my screenshot? I didn’t flash the boot image because my boot disk is attached to mainboard SATA. You should be able to additionally flash the BIOS boot image with the -b flag of sas2flash. Anyways, I managed to get it back working again, after getting the original firmware/bios from the Dell site. This article helped me for my normal LSI crossflashing endeavor and I ran into some different issues so Ill share for others to benefit from. My company buys these all the time and crossflashes them to the IT firmware for our freenas sans but they dont have issues, so the one I grabbed did. I had the Error cannot flash IT firmware over IR firmware error like others have. My corrective action was to download a few different versions to find either a firmware or sas2flsh that would allow this type of overwriting. I loaded up the links above onto my dos flash drive giving me versions P7 and 2 versions of P20 (20.00.07.00 and 20.00.04.00) which I do know people are complaining about bricking (or other, didnt read into it) issues with 20.00.00.00 so I didnt bother with that one. Erasing with P20(7) gave me the IR/IT error so any attempt I loaded the IR firmware so the card had SOMETHING so I wouldnt brick it. (this was part of my trial and error portion, I think I flashed this thing 6-8 times). I ended up erasing with P7 but trying to load P7 gave me an error which I believe could have been correctable nvdata mfg page 2 error by using the -sbr switch. not sure but I didnt attempt. I changed over to the P20(4) directory and tried to load the IT firmware using that exe and .bin on the erased card and it worked. I then changed directories to the P20(7) and then erased then loaded the IT firmware successfully. I would like to flash my H310 to LSI IR firmware as my Dell T20 has issues with card when using raid 1, it bluescreens. How do I do this, can anyone help? I figured out how to get my H200 to work in the integrated slot in an R510. I wrestled with it for many hours of frustration, so I thought I’d post for other to enjoy… I downloaded the latest sas2flsh.exe, mptsas2.rom and the 2118 bios. Did it all using freeDOS in another machine (not the R510). When I put my H200 with the default IP firmware in the “storage slot” my R710 fails to boot. Putting it in one of the other PCI-E ports, it works fine. Is there a way to get any H200 to work in the storage slot in an R710, with IP firmware? 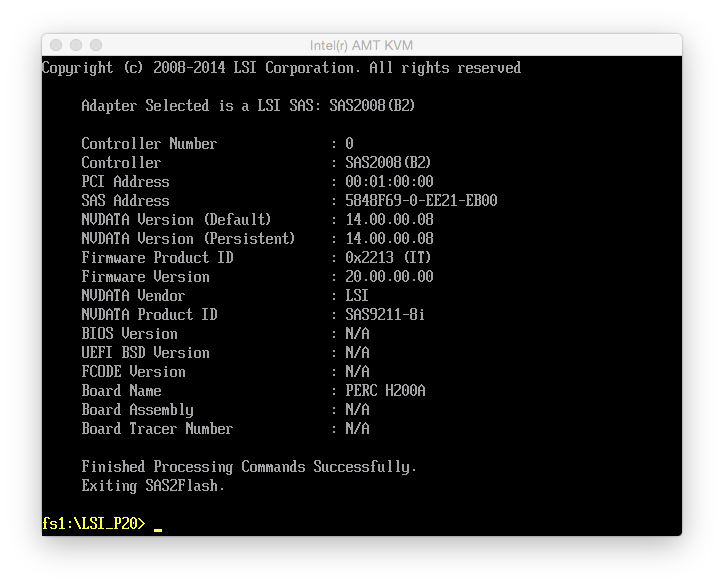 And thanks for the comments that helped me to flash in a legacy BIOS (not UEFI)! I needed to restart once to complete step 8. If you need to boot from the card in BIOS. Extract the file mtpsas2.rom from 9211_8i_Package_P20_IR_IT_Firmware_BIOS_for_MSDOS_Windows.zip folder sasbuis_rel . Really great guide and also great work to a few other people! Thank you. Managed to flash the H200 in a single pass also without any reboots and without any errors at all using a freedos USB stick in a PowerEdge R610. You should also include the BIOS flashing.